The best blues guitarists are able to combine both rhythm guitar riffs with lead guitar into one seemingly burst of fluent guitar playing. As a student of the guitar, it might appear to you that these guitarists have a natural ability to improvise with both chords and lead guitar styles. 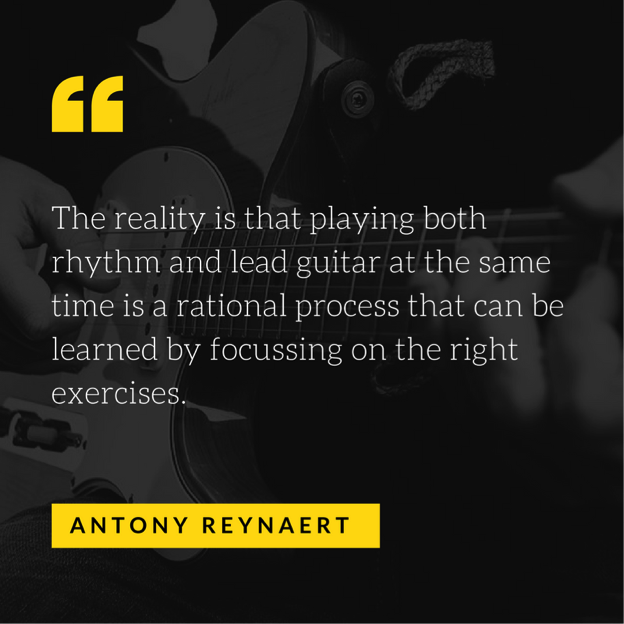 The reality is that playing in this style is a rather rational process that can be learned by focussing on the right exercises. In this article I will break down all the parts you need to be aware of to construct fluent rhythm/lead parts yourself. In the video that accompanies this article you can see me playing such licks. Learning about mixing lead and rhythm will open up your guitar playing as you will be able to decorate any riff while you are playing rhythm. You will also be able to take a step back from playing lead at any time and start playing rhythm again. When I first came across this type of playing that is commonly found in the styles of Stevie Ray Vaughan, Jimi Hendrix as well as many other guitarists, it immediately became very appealing to me to master this playing style. The only problem was that I couldn’t seem to figure out how these guitarists were able to jump from playing lead to rhythm and vice versa at random. It felt like these guitarists had something I didn’t posesses. It was later in my own personal development as a guitar player that I started to realize that what they were doing was nothing more then linking each chord to a scale. With that knowledge I could weave licks in my rhythm playing. In order to learn more about how blues chords and scales relate to one another, study my free guide on how to solo over chord changes. There was one prominent problem I had to deal with when I aspired to play rhythm and lead at the same time; I needed to learn exactly how to deconstruct the licks and rhythm parts I was playing in order to play them perfectly in rhythm. By learning to breakdown such guitar parts into several ingredients I could know start to combine many different parts in my playing. As you can see, if you know exactly how long each part needs to last, putting the rhythm and lead parts together becomes easy. What we are doing here is taking a complex set of motions and breaking them down into easy manageable parts, which is the way in which all the best guitarists became great. By following this approach I mastered this playing style over time by starting at the root of the problem; my inability to break down advanced blues guitar rhythms. If you would follow this approach yourself you’d soon start to see really positive effects in your guitar playing. Do you know the feeling you get when you listen to great blues guitar rhythm parts and you get shivers down your spine? If one would analyse these blues riffs you would come to the conclusion that these are more complex then the average blues guitar riffs you come across in tabs. In order to advance your blues guitar rhythm playing I would recommend you to download my free eBook on How To Play Blues Rhythm Guitar Like The Best Blues Guitarists. Break out of your blues guitar soloing cage that is holding your guitar playing progress hostage by learning about my essential blues guitar soloing lesson.